There is much said and written about cloud service offering. As we do a simple Google on cloud we get Millions of answer around it. All answers and articles will have one thing in common. That cloud services are offered as IaaS or PaaS or SaaS. And much have been talked about each of them, as well. Cloud application services, or Software as a Service (SaaS), represent the largest cloud market and are still growing quickly. SaaS uses the web to deliver applications that are managed by a third-party vendor and whose interface is accessed on the clients’. In the PaaS models, cloud providers deliver a computing platform, typically including operating system, programming language execution environment, database, and web server. Application developers can develop and run their software solutions on a cloud portfolio. Cloud infrastructure services, known as Infrastructure as a Service (IaaS), are self-service models for accessing, monitoring, and managing remote data center infrastructures, such as compute (virtualized or bare mental), storage, networking, and networking. Although many simplified variations of the above explanations exists, i found above info-graphic one of the better way of explaining what it is all about. 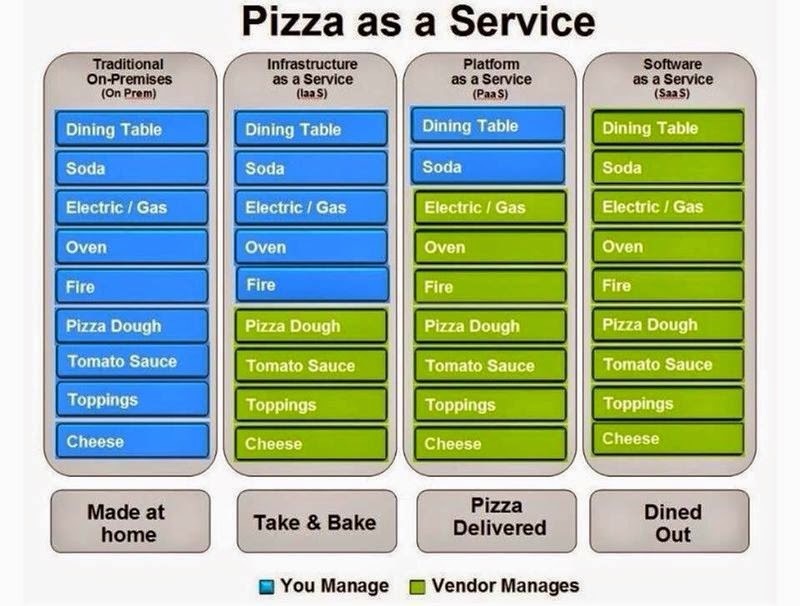 This graphic tries to explain the concept of the same terms through Pizza Delivery Service Models! The analogy used fits the cloud concept so nicely and maps to the concept of various cloud services. The concept of "You Manage" is what we used to do in the earlier days. Once ownership of a machine (computer) was given to us, we had to manage all of it. But as the concept of Internet Data Center (IDC) evolved, some portion of the management was taken away from us and was managed by the IDC folks. As the concept of cloud evolved, we have the options of choosing what we want to manage and what vendor (the cloud service provider - in case of cloud computing) should manage. And that is what is explained in the graphic. As we move from IaaS to SaaS or Take and Bake to Dinning Out, our job of managing things reduces. Just as we go out to a hotel and dine out for Pizza, we go to web site and email through services like GMAIL or HOTMAIL. In both the cases, we don't bother about what is happening behind the doors. We just order and enjoy our service!